Viggo Mortensen's son Henry saved The Lord Of The Rings. Okay, maybe we're overstating the case a bit, but things were looking pretty rocky two weeks into the shoot after Peter Jackson had shown Stuart Townsend the door [creative differences] to be left minus one of his pivotal characters, Aragorn [or Strider]. Furiously casting about to heal this 11th hour rupture, an offer arrived at Mortensen's desk. And he, none the wiser about this tale of heroism set in a fantastical world of magic, was on the verge of passing. History, it seems, is made in small moments, and from the point Mortensen stepped off a plane in New Zealand he literally transformed into Aragorn. An aesthete by nature - he paints, writes, photographs and plays jazz [three CDs to date], as well as the day job - he found the soul of the character, aligning his own trepidation at going to the ends of the Earth at a day's notice with the choices his Middle-earth alter ego has to make [he's a king in disguise]. Tales of the actor's uber-immersion wormed their way into the folklore of the shoot. He'd wander off into the mountains alone to commune with nature, he'd sit in catering, a hefty sword strapped to his back, he even bought the horse that had carried him all those months. On being told of a dawn start he requested they all camp out under the stars to await sunrise. To be in the moment. Technically half-Danish [his mother was American], Mortensen was born in Manhattan in 1958 and grew up travelling around South America. He made his break into movies as 'Young Amish Farmer' in Witness, making a bold impression in The Indian Runner, Crimson Tide and A Perfect Murder. Now, though, there is talk of imminent stardom. Give Jackson a lead and he will launch into a eulogy on his 'miracle man'. Mortensen seems content to have reached his own standards. 'I can say it, my conscience is clear,' he says without a hint of vanity. 'I did my best to study and find as much as I could. I read everything I could that was connected to Strider or Aragorn or his environment, to represent that character. I feel I did the best I could under the circumstances.' Like his fellow cast members - and this has become a creed for the Fellowship - he is at pains to emphasise the strength of the friendships that grew over the months (especially with Sean Bean) and the enchantment that these two isolated islands cast over them (with a painter's eye he talks of the different light, the proliferation of blues and greens): 'There was something that I never got tired of in the air.' 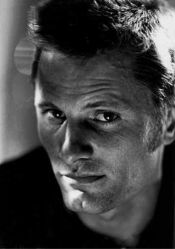 Yet, of all the actors involved in this mammoth event, Mortensen is the least upbeat, not that he's exactly negative, it's just that he's learned to his cost that some films don't necessarily reflect what was put into them (G.I. Jane anyone?). Value the experience, that's what is important.